Every day I go to a coffee shop to work on my book. And every day I witness the same phenomenon: people poke their heads through the door, look at all the crowded tables, sigh a heavy sigh and leave. I want to yell out: “Don’t leave! You’re giving up too easily!” But since most people can’t hear the thoughts in my head, they continue to march their lonely march away; and it’s for these people that I am writing this post. God willing, they’ll read it and realize there’s always a way to get a seat at a crowded coffee shop. I always get a seat when I go to a coffee shop to do work. Always. If every seat is taken, I still get a seat. It’s all a matter of strategy. (1) When you walk into a crowded coffee shop, your first job is to stake out chairs. If every table is taken, that’s fine. You don’t need a whole table. You just need a chair. So look for empty chairs and then look to see where they’re positioned. Most likely, the empty chair will be at a table where one person is sitting and doing work. This leads to tip #2…. (2) Don’t be afraid to ask: “Is anyone sitting here?” For many, that’s a deal-breaker. They don’t want to disturb anyone’s zone of solace and solitude. But the thing is, they’re not at home in their own personal library. They’re in a COFFEE SHOP where there are a limited number of tables and chairs. And most people, myself included, couldn’t care less if anyone sits at their table. If they’re wearing headphones (and most people are) their zone of solace and solitude will not be disturbed and you’ll get a seat. And speaking of that seat…. (3) If they say “no” and the seat’s available immediately drape your coat over the back of the chair and deposit your bag on the seat. This, obviously, secures the seat as yours; then go stand in line and order your coffee and keep an eye on your stuff. But congratulations: you’ve scored a seat at a crowded coffee shop! Of course, there’s the possibility that every single seat will be taken. That’s when you must…. (4) Become a hawk. Don’t leave just because every seat’s taken. Hover for a few minutes before you place your order and keep an eye on every chair in the place. Inevitably, someone’s going to leave and that’s when you pounce. (5) As soon as they stand up, race your way over to their table and ask: “Are you leaving?” Even if it’s obvious that they’re leaving, this gives you permission to carry out tip #3: the drape and drop. 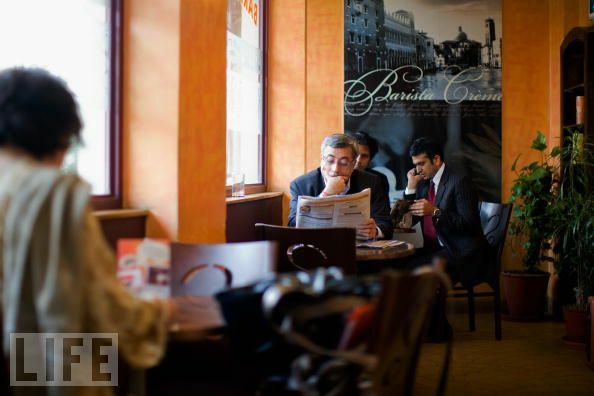 You drape your coat, you drop your bag and voila: a seat at a crowded coffee shop! So there you go. The next time you’re in a crowded coffee shop, try these tips and I guarantee, you’ll have a seat in no time. In fact, I’m writing this from a crowded coffee shop right now and there’s a chair at my table. If you were to walk in and see how crowded it was you might up and leave, when all you’d have to do is ask me: “Is anyone sitting here?” And I’d say: “Yes….you are!” and we’d have a good laugh and become best friends and throw tea parties and watch old Julia Roberts movies. All because you followed my advice for how to always get a seat at a crowded coffee shop.